This oak framed extension to a 15th Century Thatched Cottage in Essex was made using reclaimed oak beams and incorporated a lantern glass roof over the dining area. Suited to the traditional look of the beaded door and drawer styled kitchen, it was Painted in Farrow and Ball House White with 40mm Block Oak worktops. Incorporating an integrated undercounter and incolumn fridge, dishwasher and washing machine with standard 600 single butler sink. 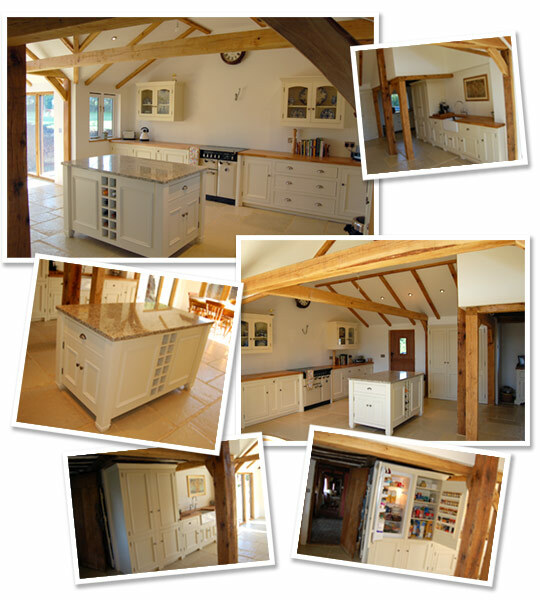 The double ended freestanding island created the ideal hub to bring the kitchen together and measured 1.5m x 900, and was finished with a Gallio Ornamental granite work surface. Please Note: No prices are shown in our Kitchen sections as all our Kitchen products are bespoke and therefore individually priced. If you would like to email or telephone us with your enquiry we will be pleased to quote you for your specific requirements.